In The Mouse Rebellion, we see the tale of group of mice who, under the courageous leadership of the “tailless little mouse,” revolt against their tyrannical cat overlord, breaking the typical cat-mouse narrative through the power of collective effort. 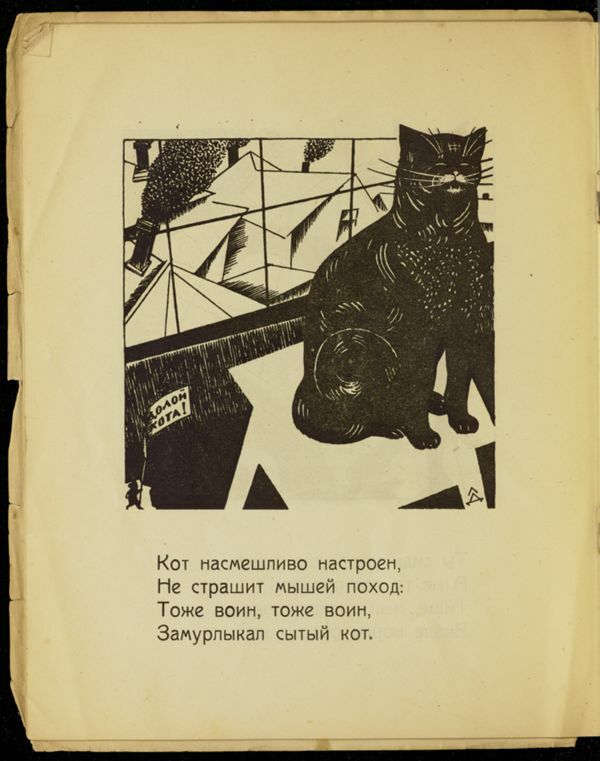 Written around 1920, The Mouse Rebellion is a relatively early example of a typical Soviet children’s book; it would have been published during the civil war that directly followed the revolution in 1917. The book’s temporal proximity to the events of 1917 cast The Mouse Rebellion as one of many attempts by Soviet authors and artists in the early Soviet years to process the revolution; in this case, we are presented a children’s parallel to the revolution, with the sympathetic “tailless little mouse” as an analogue to Lenin, and the ruthless cat as tsar. As an example from the civil war period, the book’s unmistakably pro-revolutionary lean connects it to numerous examples of anti counter-revolutionary propaganda; while The Mouse Rebellion does not explicitly attack the so-called “Whites,” the aim is undoubtedly to indoctrinate Russian children into the Bolshevik ideology. The author of The Mouse Rebellion, “Oliver Twist,” proves to be somewhat puzzling; while clearly a pseudonym, the actual identity of the author remains unknown. Although there is no definitive answer, a very strong possibility is Valentin Kataev, a popular satirist and eventual Soviet realist author, who also published a multitude of children’s books. Particularly in his early career, Kataev wrote under a variety of pseudonyms, one of which was “Oliver Twist”. While the pseudonym alone may not offer definitive proof, other aspects of Kataev’s biography suggest his authorship--Kataev began writing in 1910 at the age of 13, fought in the Red Army against the counter-revolutionaries, and would have been writing professionally by 1920. While he is perhaps best known for Time, Forward!, a Soviet realist novel, Kataev’s early works were often humorous and light-hearted, further supporting his authorship. While the artist, L. Dubrovskii, is relatively unknown, the woodblock print illustrations draw upon a long cultural history of woodblock and lithograph prints known as Lubok. This style of printing, likely chosen here for its cost and time efficiency, was a uniquely Russian folk style stretching back as far as the 17th century; while Lubok largely faded out after 1917, it had a significant influence on early Avant Garde artists such as Malevich, and in 1920 would have been immediately recognizable and distinctly Russian. Nedd, Andrew M. “Segodniashnii Lubok: Art, War, and National Identity.” Picture This: World War I Posters and Visual Culture, edited by PEARL JAMES, University of Nebraska Press, LINCOLN; LONDON, 2009, pp. 241–270. JSTOR, www.jstor.org/stable/j.ctt1dgn3t0.13.